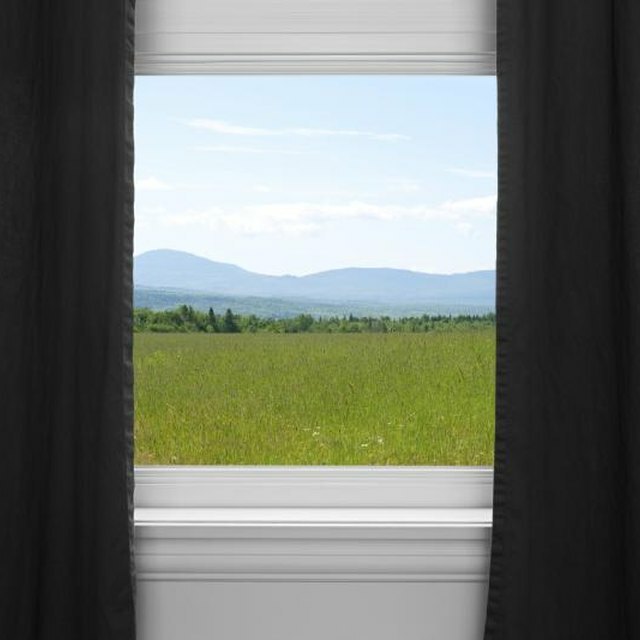 Installing curtains is a great way to enhance a home's décor and to increase privacy. With literally thousands of fabric, style and color variations to choose from, there are curtains to fit every taste. Although many people spend thousands of dollars on custom window treatments, ready made curtains are easy to find and fit any budget. Take and record window measurements. Using a metal measuring tape, measure the height and width of each window that needs curtains. For accurate dimensions, measure height and width at the top, middle and bottom of each window. Carefully record measurements, making sure to correctly label height and width, and round numbers to the nearest 1/8. Decide whether you want curtains mounted inside or outside the window frame and determine measurements accordingly. Pick a curtain style. Depending on your home's décor and the function of the room in which you plan to hang curtains, you may choose a casual, semi-formal or formal style. Café curtains and stand-alone valances look great in kitchens while heavy, pleated ceiling-to-floor drapes are most appropriate for formal living areas and dining rooms. Other popular styles include flat or pleated panels made from a single piece of fabric, and swag top treatments that extend down window frame sides. Choose a fabric. Satin, silk and jacquard have a formal look and complement traditional designs especially well. Open weave or casement curtains are far more casual and have generally have more visible texture. Patterned curtains are usually made from cotton or a cotton blend and can fit nicely in any room. Sheers or nets allow light in, but provide privacy and look nice behind heavier window treatments or on their own. Decide whether you want to buy liners. Curtain liners are most appropriate behind heavy drapes and in formal settings. Liners are also a good option in rooms where one needs more privacy, such as bedrooms. High quality liners can protect curtains from fading due to sun exposure and from condensation or dirt that comes from small gaps in window frames and panes. Used a blackout lining to prevent sunlight from entering a room or install insulated liners to increase energy efficiency. Buy curtain accessories. You must buy a rod for curtain hanging but most other add-ons are optional. Finials, tie backs, holdbacks, tassels and trim are decorative items that can enhance the appearance and perhaps the function of curtains. Curtains fit onto rods in a variety of fashions. Tab tops, which have simple fabric tabs that loop around rods, are particularly popular as are grommet tops, that feature metal-lined holes for rod insertion. Most traditional curtains shirr onto rods, simply bunching material around the rod, obscuring it from view. Curtains can hang from ceiling or floor or from top of window pane to floor. For a trendy, formal look, puddle curtains or allow them to bunch on the floor, creating rippling folds similar to puddles. Puddling can make window treatments very heavy, which may be impractical in a room where curtains must often be pulled back or moved on a track.